The world's worst boss may be a big-time movie star, but he'd still love to be covering the conventions. 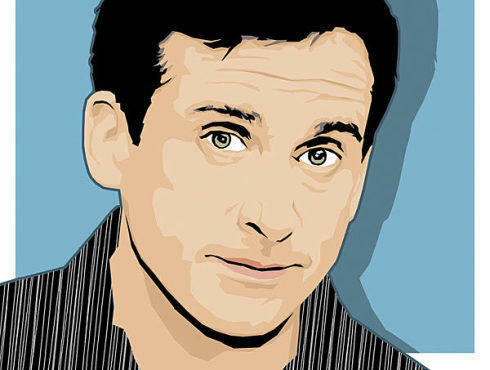 When Steve Carell left The Daily Show in 2004, not even his biggest fans could have predicted how huge a star he'd become. But the 45-year-old actor parlayed his stint there into the plum role of bumbling boss Michael Scott on the American version of The Office, chased it by cowriting and starring in Judd Apatow's 2005 instant classic, The 40-Year-Old Virgin, and appeared the following year as the morose uncle in the Oscar-nominated indie darling Little Miss Sunshine. Fresh off the fourth and highest-rated season of his NBC sitcom, Carell channels the late Don Adams this week in a big-screen adaptation of Get Smart, the cultish spoof television series about gadget-befuddled secret agent Maxwell Smart. You're calling me on a shoe phone, aren't you? Sure. And I'm calling you from the depths of this enormous gym at USC. We're shooting a special promo for Get Smart. Well, I'm talking to you from my Brooklyn apartment on my underwear phone. NNice! Do you actually give yourself a wedgie in order to answer it? It rings and you have to pull it up over your head? Sadly, yes. It must have been hard not to do an impersonation of Don Adams in the film. You even have to say, "Missed it by...that much." I do. Those are the hardest lines to say because his readings of them are so ingrained. Growing up, everyone—myself included—imitated Don Adams's voice. It's hard to hear them any other way. So you're shying away from an Inspector Gadget movie, then? No. Next I'll do Inspector Gadget and then the live-action version of Tennessee Tuxedo. [Pauses] I do seem to have made a habit of this. You're referring to the American version of The Office, right? Yeah. I was faced with the same challenge there. I watched Ricky Gervais and there's no way I could do what he did, and I didn't want to do an impersonation of him, either. Speaking of Gervais, when is the crossover episode happening? Between the American and British versions of The Office? With any luck, never. That would be such a whorey thing to do. What, and miss out on the chance to do a good old-fashioned dream sequence? Oh, boy—you're talking like a network programmer now. I'm sure those types of things have been bandied about, but as long as Greg Daniels is in charge there's no way anything like that will ever happen. It would seem like such a stunt. But maybe it would be cool to see that ten years from now, when both shows are a memory and we could do it on a sketch on SNL. How many times have you looked into the camera for effect on the show? Thousands, I'm sure. And you know what? It's a hard habit to break! Last year, I went from shooting The Office right into Dan in Real Life, and I found myself on the first couple of days constantly looking into the camera to kind of punctuate whatever I was doing. And I thought, Uh, I think somehow this is not going to work. Do you ever miss The Daily Show? Yes, especially at this time of year. With the conventions coming up, I know what kind of fun they're about to have. So there is a sense of envy there. I'm sure they envy you, too. Well, perhaps. If they do, they disguise it very well. But, oh my God—Colbert? Colbert has his own ice-cream flavor! He has a Ben & Jerry's flavor and he has a portrait of himself hanging in the Smithsonian. My own career pales in comparison. He has far eclipsed me. Well, at least you can enjoy his ice cream. That's right. With a big grimace on my face. Get Smart opens Jun 20.